This USB device may be used with any RIGblaster that uses the PC internal sound card. It adds another sound device to the PC so you don't need to use your primary sound device for the RIGblaster. 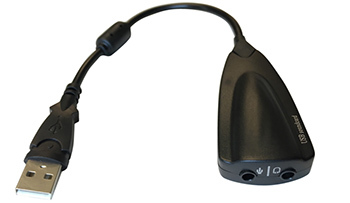 The two audio cables that come from the RIGblaster/Radio will connect to this device and then this device plugs into a USB port on the PC.